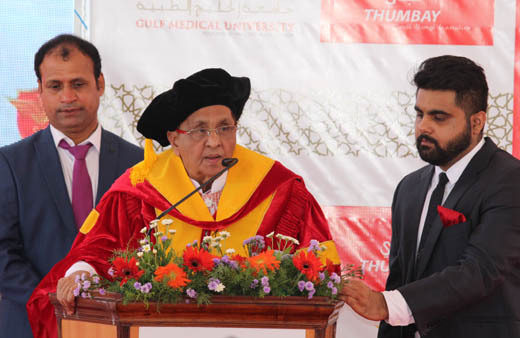 Mangaluru, May 01, 2016: Eminent entrepreneur, businessman, educationist and philanthropist, Chairman - BA Group, B Ahmed Haji Mohiudeen conferred with honorary Doctorate by Gulf Medical University in a glittering ceremony at Thumbay hills on Sunday, May 01, 2016. 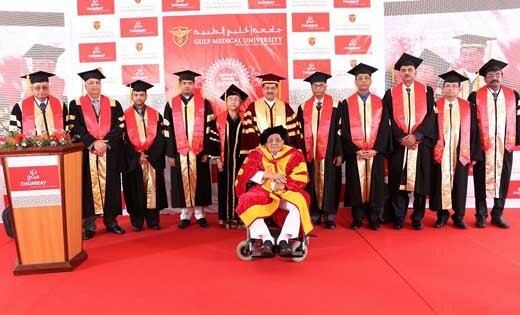 He has been conferred with the honorary doctorate in view of his outstanding contributions to community development, by Gulf Medical University (GMU), the leading private medical university of the Middle East region located in Ajman, UAE. 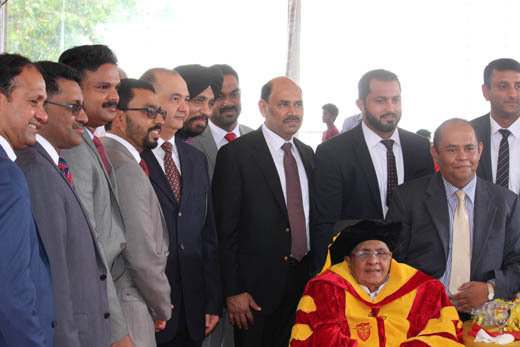 Mr. Ahmed Hajee received the doctorate from Mr. Thumbay Moideen – Founder President of the Board of Governors of GMU, in the presence of Prof. Gita Ashok Raj – Provost of GMU and the Deans of GMU. 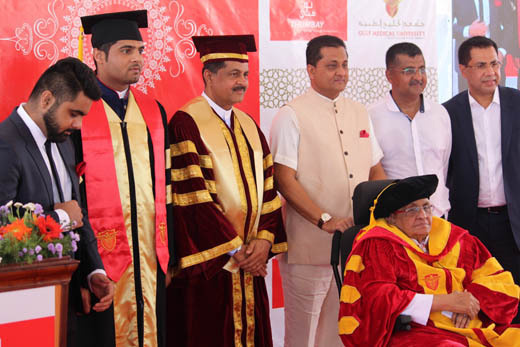 It was indeed a happy occasion for the family members, friends and well wishers to witness the gracious ceremony. 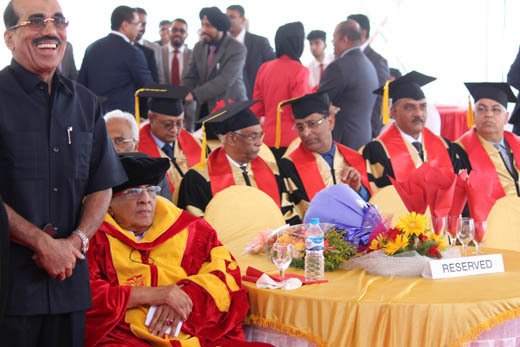 In his speech, Mr Ahmed Hajee appreciated the gesture of honoring him with a Doctorate by GMU. 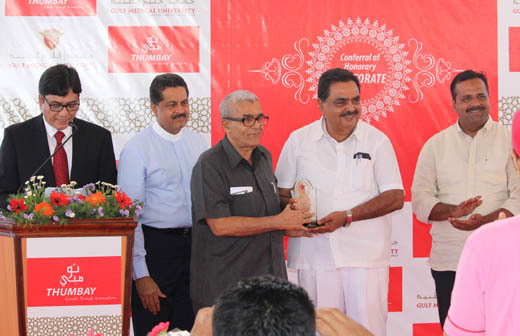 "It is indeed a great moment and I am proud of my son Moideen and his achievements” he said. "I had started my business over six decades ago. It was hard in those days. My business grew as the years gone by. My sons made it big. I am sure they will do better in the years to come. I thank almighty, Allah for all the blessings." 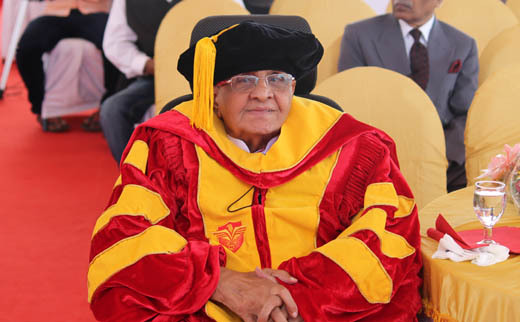 Mr. Ahmed Hajee was born in 1933 to Mr. B. MohiudeenHajee and Mrs. Mariamma in a business family in Mangalore. 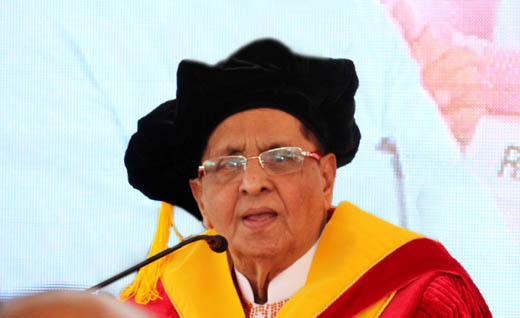 He graduated in Commerce in 1954 founded the B A Group in 1957, of which he is the Chairman. Today, B A Group is a well-diversified conglomerate. 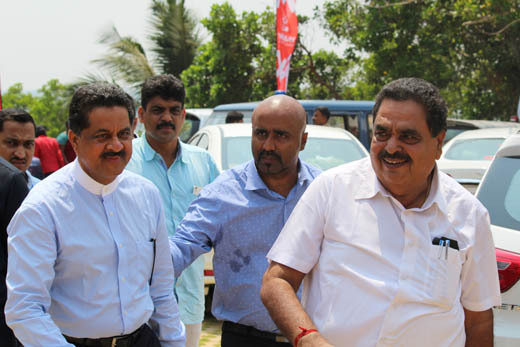 Mr. Ahmed Hajee is a distinguished figure among the general public in Karnataka, particularly Dakshina Kannada, by virtue of his proven track record of excellence in industrial, educational, philanthropic, social and community services. 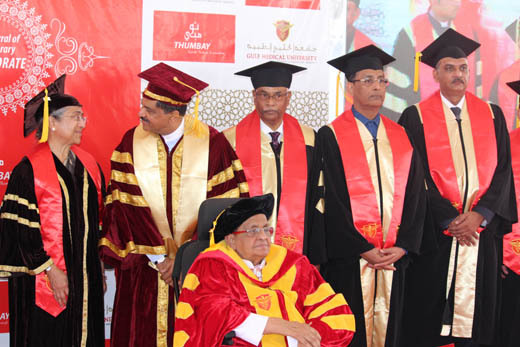 The B A Industrial Training and Technical Centre is sponsored and managed by Mohiudeen Educational Trust, of which he is the Chairman. 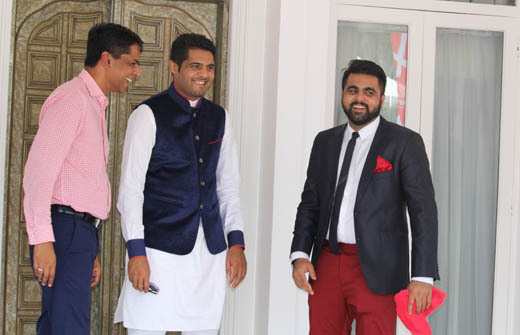 The Trust also runs a Kannada and English Medium School, a Pre-University College a Nursery School, a Medium Primary School and DarulUloomMohiudeen Arabic College. There are more than 1500 students in these institutions. 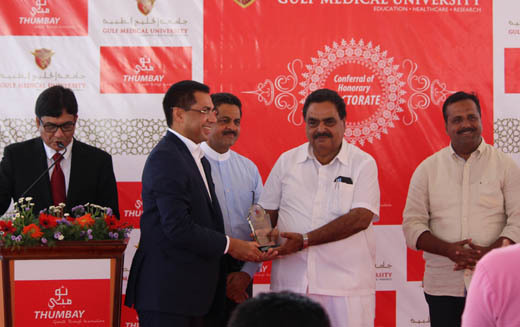 Mr. Ahmed Hajee is a Board Member of Yenepoya Medical College and Yenepoya Dental College in Mangalore. 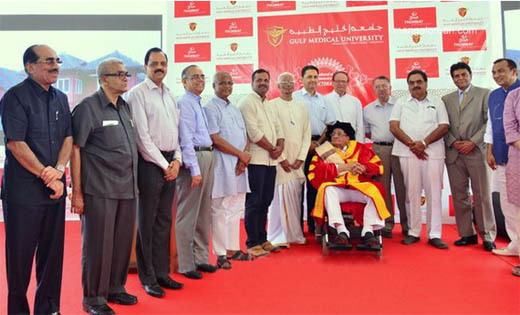 He was also a member of Adult Education Society, Government of Karnataka and had served as a Syndicate member of Mangalore University. 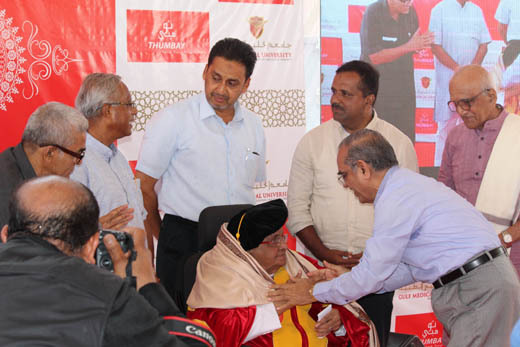 As an enthusiastic philanthropist, he has focused on the spread of education to weaker sections of the society and has contributed immensely to the community development and women empowerment in Mangalore and surrounding areas. 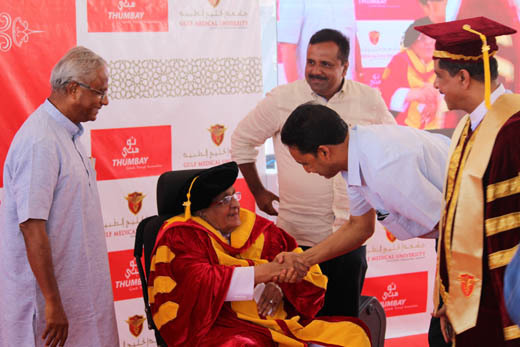 He is the founder president of a number of institutions and trusts in and around Mangalore, and serves as the head of around 1000 masjids. 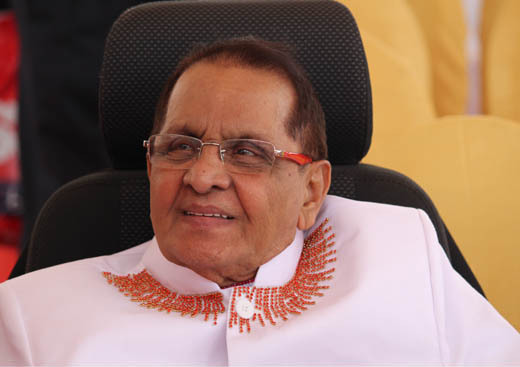 Mr. Ahmed Hajee has received several awards and felicitations for his achievements as a businessman as well as philanthropist. 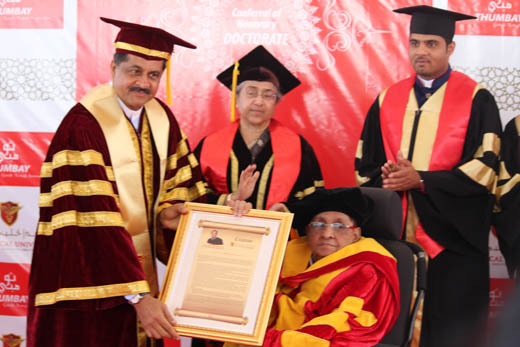 He had received the ‘Lifetime Achievement Award’ from the former President of India, Dr. A. P. J. Abdul Kalam. 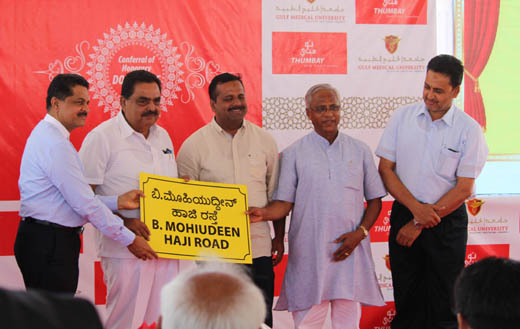 A new road in Kandak, Mangaluru has been named after late Mr. B. Mohiudeen Haji, father of late Mr. Hassan Hajee and Mr. B. Ahmed HajeeMohiudeen - Chairman of BA Group India and grandfather of Mr. ThumbayMoideen – Founder President of Thumbay Group UAE, to commemorate his active participation and matchless contributions to the growth and progress of the area.Mr. 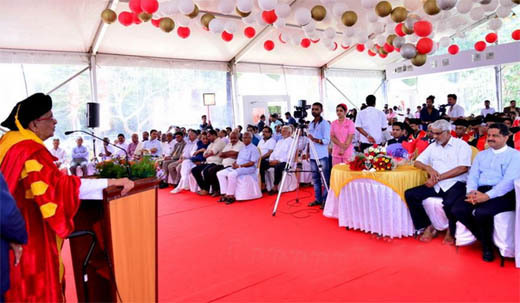 U. T. Khadar, Minister for Health and Family Welfare – Karnataka, formally announced the naming of ‘B. 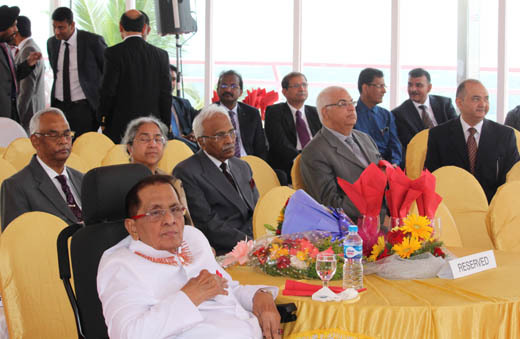 Mohiudeen Haji Road’ at this special function on Sunday, 1st May 2016. 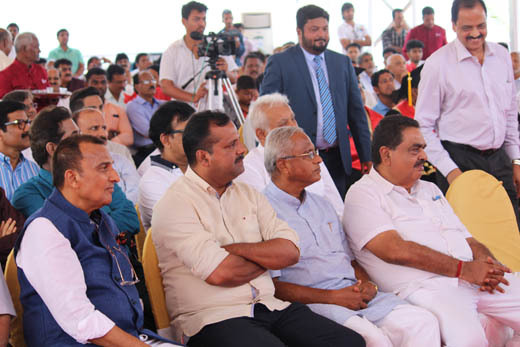 The function was also graced by the esteemed presence of Mr. Ramanatha Rai - Minister for Forests, Ecology and Environment of Karnataka and several other eminent dignitaries. 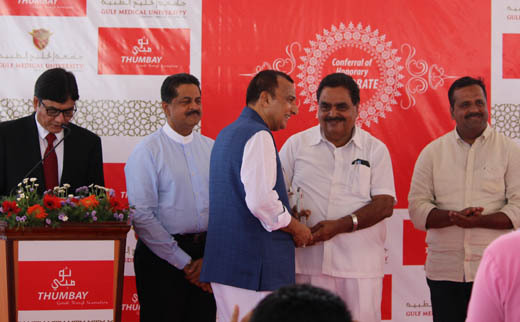 Mr. Ramanatha Rai and Mr. U. T. Khadar also handed over the ‘Token of Appreciation’ awards to Mr. Abdulla KunhiBaikara, Mr. Yenepoya Mohamed Kunhi, Mr. B. MohideenHasanHajee and Mr. Haji C. Mahmood,in recognition of their outstanding contributions to community development.Mr. 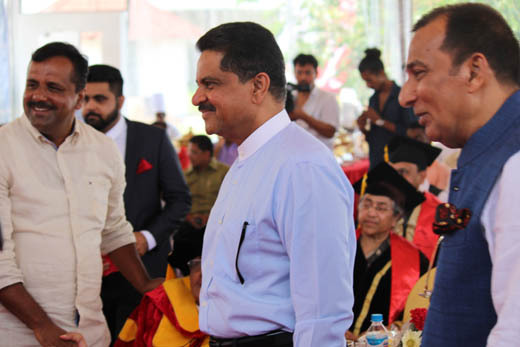 Yenepoya Abdulla Kunhi and Mr. K E Faizal were presented with the ‘Senior Achiever of the Year’ and ‘Young Achiever of the Year’ awards respectively, to recognize their unique contributions to community development. Among the ladies, the ‘Token of Appreciation’ was awarded to Mrs. Beefathima Ahmed Haji, Mrs. Ayesha Abdulla KunhiChunge and Mrs. NafeesathBeebi by Mrs. ZohraMoideenThumbay, Mrs. Nousheen Salma and Mrs. ShabanaFaizal, respectively. 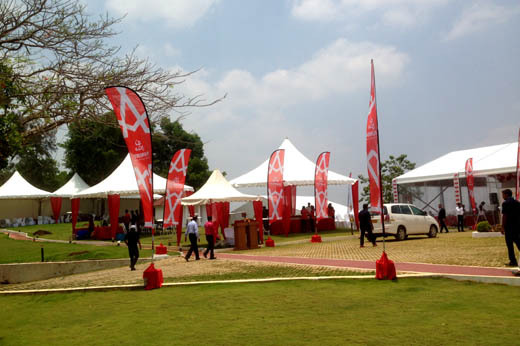 The function was followed by lunch. A golden moment to the family . We bow to you Sir. It was Proud and a Happy moment to the family and friends. We all hope to see better in our future too . They are the GEM and the unique creation of GOD. It is not an easy task to reach such a height. it is because of dedication and determination. Congrats and Wish you success. Outstanding developments by the Moidheen family . They have been a good example for today’s youth . 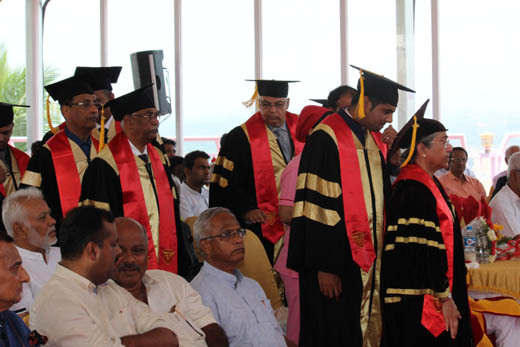 Their sincere effort and hard work has been contribution to their achievement. Congratulations to all.